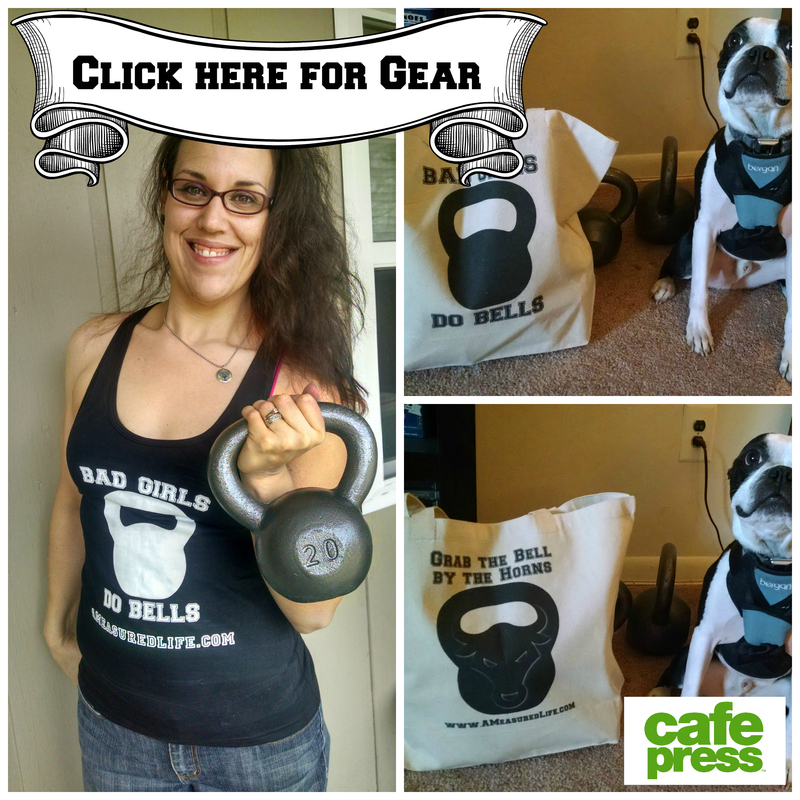 May 3 – Grocery Day! This day started out EARLY. I woke up naturally about 4:45 and just got up. The Hubs was already awake. I tooled around for a while but finally decided I should get out and shop at least one place before I met my walking group for a little exercise and breakfast. So I headed to Walmart around 6:30. It didn’t take me long to figure out how the iBotta app works (my referral code is grehisj): you find the items they offer rebates for, and then you scan the barcode to make sure the item is eligible for the rebate. Pretty easy! I found all the things I needed and validated them, then checked out. Now I realize that it was about 7 am on a Sunday, but there was literally one checkout open, and it was 10 Items Or Less. Seriously, Walmart? Luckily there weren’t many people in line, and I got out of there quickly. The only other thing I had to do on the iBotta app to claim my rebates was to scan the QR code on the bottom of the receipt and submit! Within a couple of hours my rebates were approved and $2.60 was deposited into my iBotta account. I also got a $0.50 bonus for claiming my first rebate! So as of about 8 am, I had saved $3.10 with iBotta. After Walmart I met up with some lovely ladies in my walking group for a stunningly beautiful walk along the Delaware River, followed by breakfast on the water. It was glorious! It’s so wonderful to have women to hang out with. Plus, exercise! 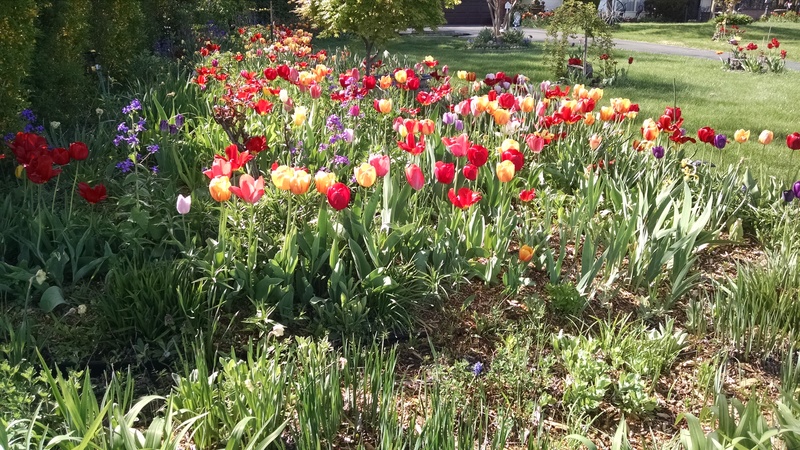 Plus I got to see these stunning tulips!! On my way home I stopped by ShopRite to pick up some more things, then stopped at Produce Junction to grab fruit and veg. I bought grapes on a whim here, because they were $2 lbs for $2. CHEAP! And good for snacking. I claimed the rebate for my bananas and strawberries with Checkout51. It works very similarly to iBotta. I saved 75 cents, but unlike iBotta, I have to wait until I reach $20 to cash out. That might be difficult to do before the end of the month, even with the $2 signup bonus. It didn’t take long before the rebates from ShopRite were approved as well for a total of $4.20 cents saved my first week on the iBotta app. I need to get to $10 before I can deposit it into my account, but I should hit that before the end of the month no problem! 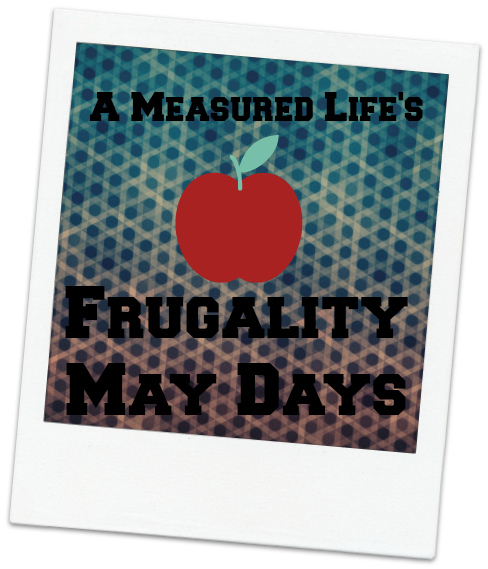 May 4 – Grocery Day 2! 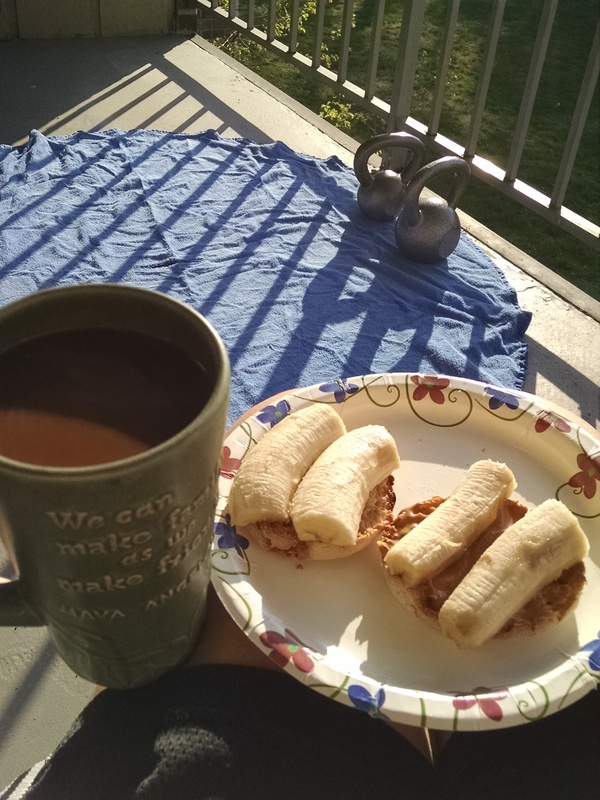 Bells & breakfast on the balcony. I did not want to get out of bed on this particular morning. I was exhausted. I’ve been working out a LOT lately, and the weather has warmed up, and I’m just beat. So I goofed off for a while before doing my kettlebell workout after breakfast on my balcony, then goofed off some more then showered, and finally got dressed after noon. I ran out to Aldi’s to check out a hydration backpack they had for $14.99 (did not buy) and to pick up potato chips for The Hubs, because I forgot to grab them before. I also bought a half pint of blackberries on a whim. (Did you notice my whim purchases were both a) cheap and b) fruit?) I spent a grand total of $3.97 here, but it was difficult to not buy all sorts of cheap snacks for The Hubs. I behaved myself! Then I drove to Acme to grab buy one get one fryer chickens and a 2.5 gallon jug of water for work. I have to say, I was a little disappointed in the price of the chickens. $1.99 a lb then BOGO free is 99 cents a pound. Not any cheaper than when they go on sale at Shoprite, but oh well. 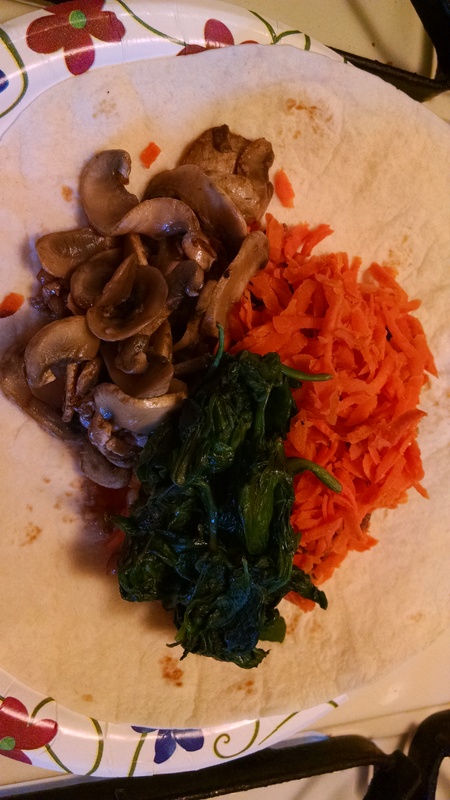 Dinner was Bulgogi Bibimbap Burritos and DELICIOUS, even though I totally forgot to put the egg on it. Is it really bibimbap without the egg? DISCUSS! Didn’t purchase anything new today. Leftover Bulgogi Bibimbap Burrito for lunch. Ate the Chocolate Hazelnut Pancakes we had stashed in the freezer, along with the breakfast sausage patties and ripe mangoes and blueberries before heading out to see Avengers: Age of Ultron. The Hubs wanted to get a soda at the theater but all it took was a look at the price for a small ($4.25) to put the kibosh on that! Other than the movie tickets ($11 for TWO because it was half-price Tuesday, score!) we didn’t spend a dime. If you know me well, you know I love fresh bananas, but I eat them only when they’re still a bit green on the outside. I get a lot of crap about this, but dang it, it’s how I like them! When they get ripe they’re too cloyingly sweet and, well, too banana-y for me! I don’t like banana flavored things really, and would usually prefer to avoid banana bread. 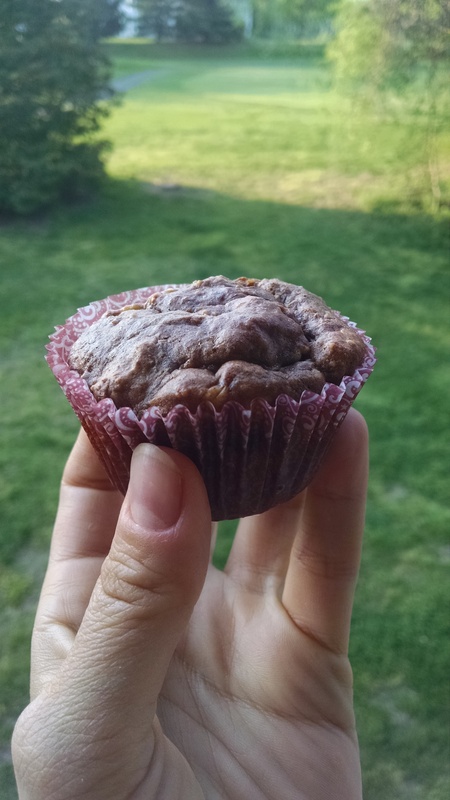 BUT as this is Frugal May, and I had not one, not two, but THREE overripe (and I mean overripe, not just ripe) bananas taking up space in my fridge, I decided I would look for a recipe. I know my coworker/5k buddy Josh loves banana bread, and I couldn’t find it in my heart to waste the bananas, as cheap as they are. Being me, I wanted this banana bread to be as healthy as I could make it, so that I wouldn’t have to give it away entirely. Now I still had one banana left. Ugh. I had made banana soft serve before, so I decided I would do that. I mashed it up in a plastic container with 1 tablespoon of cocoa powder and a pinch of salt. I stashed it in the freezer for later. No sense in wasting it, eh? Leftover pancakes, sausage and fruit for lunch. Guilt-free Turkey Pastelon for dinner, with a side of peas. I’d never had Pastelon before, and it was SO GOOD. WILL make again. It would have been a spend-free day but we took Bingley with us to the custard shack down the street for frozen custard, so that’s $4.45 out of our $20 snack kitty, leaving $15.55. I also got notice that Shopmium deposited my rebate for my Lindt Excellent Chocolate bar into my Paypal account! Leftover Pastelon and peas for lunch. Crockpot Lentil & Millet Coconut Curry for dinner. Except I forgot to add the oil, and the carrots. And the coconut milk powder. We had this with Pillsbury Crescent Rounds I’d had sitting in the fridge, and habanero hot sauce to make up for it’s blandness. Spend-free day. We needed dog poop bags so we ran over to Dollar Tree after dinner. I also read on the web that I could get Rimmel Eyeshadow there for free with a printable $1 coupon, and that I could get Carefree pantyliners there for $0.50 with a coupon, so I grabbed those coupons. I decided to keep all of my coupons in my wallet, just in case, and this worked out: The Hubs wanted popsicles or something cold because it’s been so darned hot lately and I’m refusing to turn on the air conditioner. I had a coupon for $1 off 2 boxes of Luigi’s Water Ice, and Dollar Tree had them! So we got two boxes of water ice for $1. They did not have the Rimmel eye shadow, but they did have the Carefree. The Hubs grabbed some candy for his work, and we of course, got dog poop bags. Since this challenge is about groceries, I will count the candy and the water ice against my total for the week: $2.07. There wasn’t enough pork for me to have BBQ Pork Salad again today, but there were plenty of black beans, so for lunch today I’ll have a salad with double black beans, cheddar cheese, lettuce, tomato and salsa. I’m also very unhappy about the Shoprite brand Light English Muffins I purchased this week. I bought them on Sunday and the Sell By date was May 5th. On May 6th I went to eat one and I found a couple of them were already moldy! I think I managed to eat two of the six in the package, which makes this frugal lady pretty mad. So for breakfast this morning I ate Pork Fried Sorghum from the freezer. Dinner was Spatchcocked Peach Roast Chicken with Creamy Grits and gravy made from the drippings. Uh, yum. We also had a frozen veg on the side. After dinner we went to visit Josh at Collingswood’s Second Saturday, and we stopped at WaWa and got pretzels and lemonade, spending $3.33 from our “snacks” kitty, leaving $12.22 for the month. The deals of the week were the Lindt Excellent bar I got for FREE using the Shopmium app (use my referral code KCGGYKKY when you sign up to claim yours), a Luna Bar I got for 50 cents, the jar of Ragu I got for 68 cents, the So Delicious Coconut Milk (I actually got PAID 2 cents to buy this, and I use this coconut milk in my coffee every day anyway) and the Land O Lakes Brown Eggs, which I got for $1. All in all I feel pretty successful! I had also purchased a 1 lb bag of Nature’s Best Zero Carb Isopure Protein Powder in Creamy Vanilla ($15.49) from Amazon.com which came with a free sample of Starbucks Doubleshot Coffee + Protein. I chose the dark chocolate flavor. This was delicious. No weird protein shake aftertaste at all. I plan on using the protein powder to make homemade protein bars! How did YOU save money this week? Looooooooooooved reading this blog. You did so awesome! Also, those Paleo banana whosa-whats-its sounded YUM! I am super impressed and may try those rebate apps. I also agree 100% on the bananas and eat them the same way. I didn’t save any money recently but you may just inspire me. I LOVE big salads for dinners during the summers!! Salad veggies are cheap, especially if you know how to prep everything ahead of time and store them in your fridge. 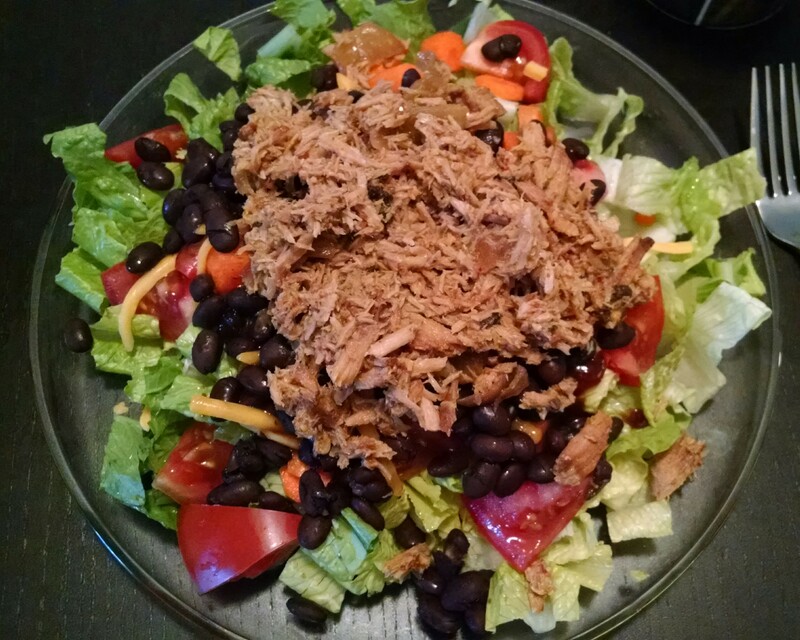 Seriously, SP’s Slow Cooker Salsa Chicken is AWESOME on top of a big veggie salad, with just a bit of Ken’s low fat Northern Italian salad dressing to amp it up a bit. I am totally pinning those banana things for later. 🙂 Unlike you, I can not get enough banana in my life. Which reminds me, I’d best freeze a few (alternative to ice cream and popsicles in the hot months, plus chuck them and other frozen fruits in a blender with some kind of liquid for a nice smoothie whenever.) I always freeze bananas that look like they’re about to go the wrong side of ripe. And, I’ve got a new-found obsession with flourless banana pancakes, which are a good darn bit cheaper than gluten-free waffles.